Lesson fees are non-refundable. If student fails to give stables 24 hours notice of cancellation, student will be billed at 1/2 lesson rate. If instructor fails to show for a lesson and stable cannot provide an instructor, student will receive a free lesson. Makeup lessons will be scheduled for coordinated absences. 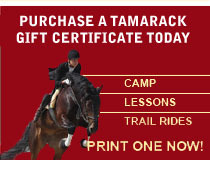 To register, download and complete Lesson Registration, and Rider Release forms, and return to Tamarack with your deposit check for 50% of total fee. Balance is due at first class. Registration is NOT complete without payment.